WE talk about coffee a lot. And so does our April Guest, Bulletproof’s Dave Asprey. 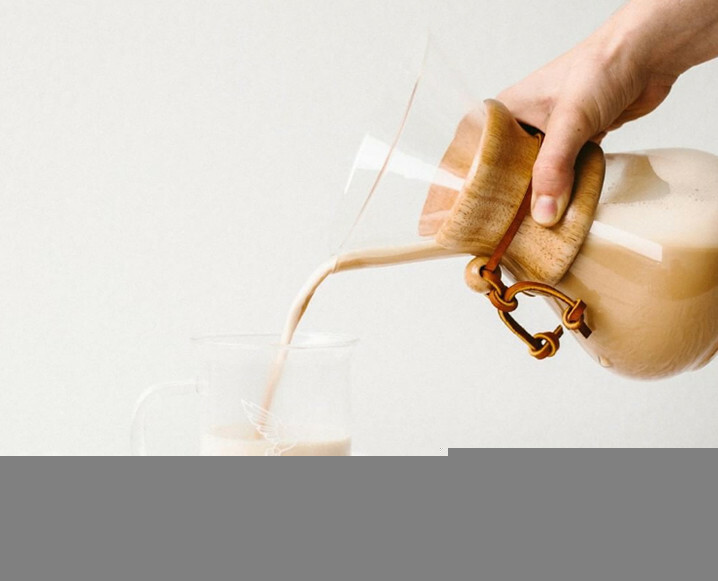 Chances are you’ve heard of his buzz-worthy Bulletproof coffee recipe, maybe you’re even making your own version — but are you making the version that set fire to the trend? We’re sharing how to make Bulletproof Coffee the right way from the OG himself. The quality of each of these ingredients makes a big difference here. It’s key that the coffee used is mold-free (yes, this is a thing! And mold has a big connection to ‘brain fog’), the ghee comes from grass-fed cows, and the coconut oil is MCT oil (read Superfood Spotlight: MCT Oil). For the real deal, Bulletproof’s own coconut-derived products are very good. Brew coffee, using a metal filter if possible (like french press or gold filter drip). Boil extra water and pour it into a blender while your coffee brews to pre-heat the blender. Dump out the hot water from the now pre-heated blender and add the brewed coffee, butter, and Brain Octane oil. Blend until there is a thick layer of foam on top like a latte. The stronger the blender, the better. A spoon won’t work. Add cinnamon, vanilla, dark chocolate, or a sweetener like Stevia, erythritol, or xylitol. Enjoy warm! Share the post "Like Buttah: How To Make Bulletproof Coffee The Right Way"
I’d love to know the best blender for bulletproof coffee. My first Ninja couldn’t take the heat and broke. Since then I’ve been using an immersion hand blender but don’t like the idea of blending it in a plastic cup. Any recommendations? Maybe this diet is great for men, but all the saturated fat in unlimited amouts of meat, eggs, coconut & dairy (some lchf protocols allow dairy) pushed up my cholesterol to near fatal levels and I didnt lose any weight or feel better. My system became increasingly sluggish and my reproductive system was thrown right out of whack. I’m far healthier and leaner on high fruit & veg severely limited flesh protein and gluten-free cereals in moderate amounts. We’re all diffetent and no one diet plan fits all. Keep an open mind and watch your body’s response very closely, especially after 12 months, or sooner even, after changing your eating habits. When you say the oil is “stronger” , what exactly are we referring to? Love your comment, Michelle. Everyone’s experience is going to be different and there is no ‘one size fits all’ approach to good health. Question. I like my coffee really really hot. Can I use my hand held frother with the above recipe, add some heavy whipping cream as I love creamer and heat it up note in microwave to get it hot like I like it?? Put your hot coffee in the MW FIRST. Heat it a little hotter. Then put the oil and butter in, frothed or not depending on your druthers. Refrain from microwaving the oil or butter because the MW can kill some of the nutrients in both of them. Better to get the full Monty.